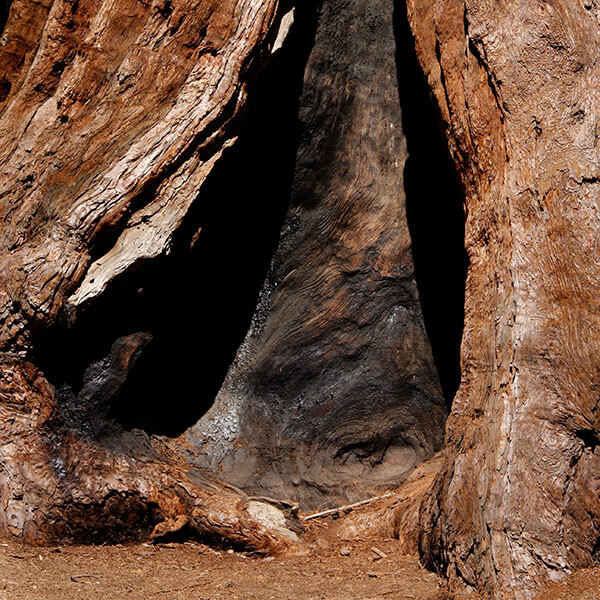 These and other photographs of sometimes very small details posted in the earlier YOSEMITE FRAGMENTS gallery are of Yosemite National Park in 2009. A dusting of grey lichen added highlights to this rich red and deeply fissured tree bark. 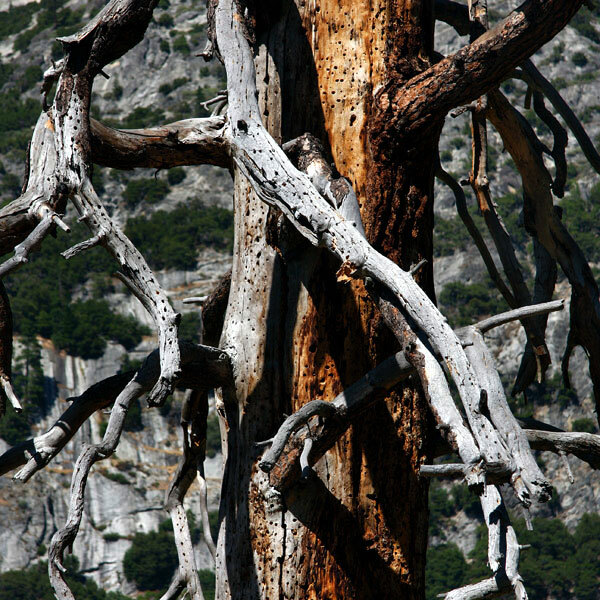 A gaunt tree skeleton encountered whilst walking from the Lower Yosemite Falls across the meadows to Yosemite Valley Chapel. The staccato sounds of an active but unseen woodpecker busily adding to the perforation patterns broke the stillness of the day. I liked the combination of the decaying red and grey woods set against the dark granite of the landscape beyond. This group of Mariposa Grove images was made whilst walking out on footpaths to Galen Clark's cabin through the Sequoia woodland. 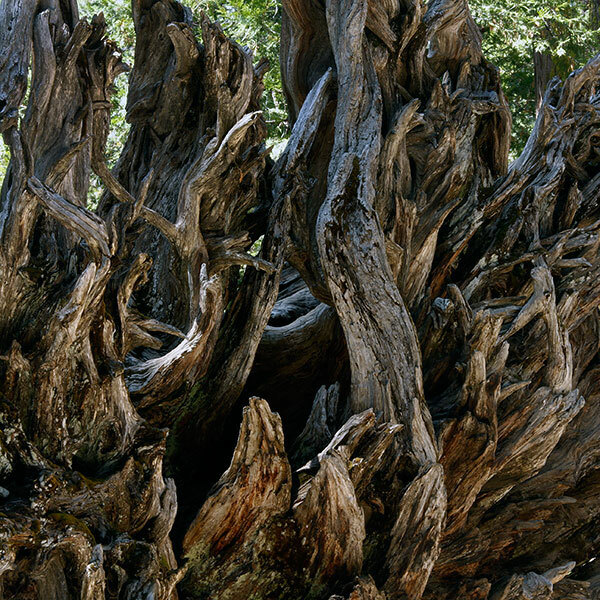 Here, one of them lies prostrate in decay with weathered roots reaching high above the forest floor. 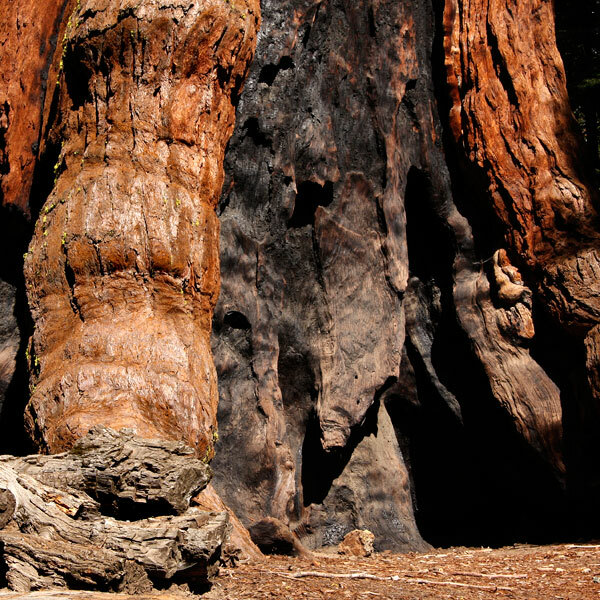 Fire has seared deeply into this Sequoia yet protected by a thick fibrous bark it survives largely unscathed. The giant's cones are hen's egg in size helped by fire or gnawing animals to release the seeds they contain. Studies have shown that seed falling on to ground cleared by the flames are the most likely to germinate successfully. I recall the grounded log as being some three or so feet in diameter and providing a reference scale to its monumental living companion. 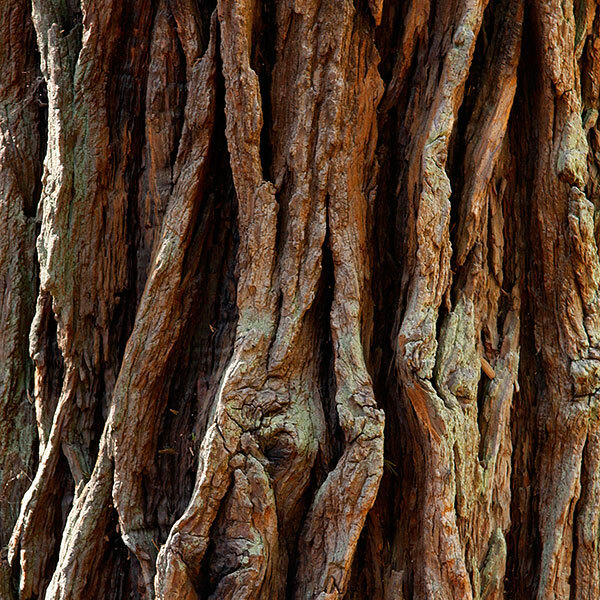 The richly coloured and textured bark is gentle to touch. 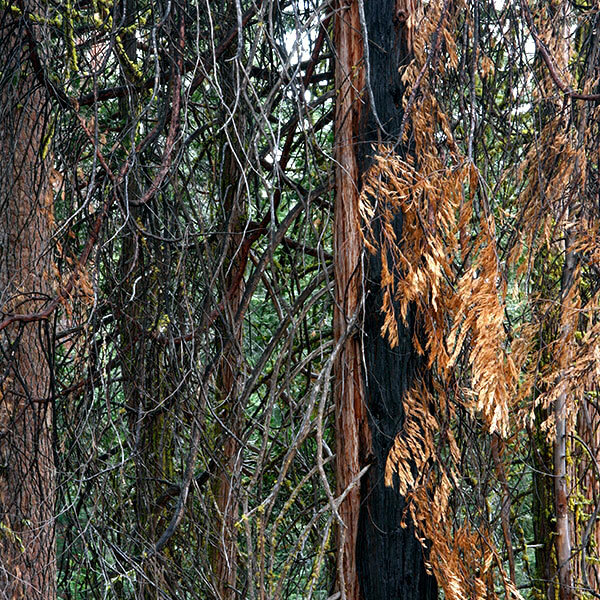 The trails passed both scorched and more heavily burned trees. Here, one partly blackened trunk, crown untouched, stands amongst singed branches and unscarred companions. Much of the bark had gone from this fallen tree. 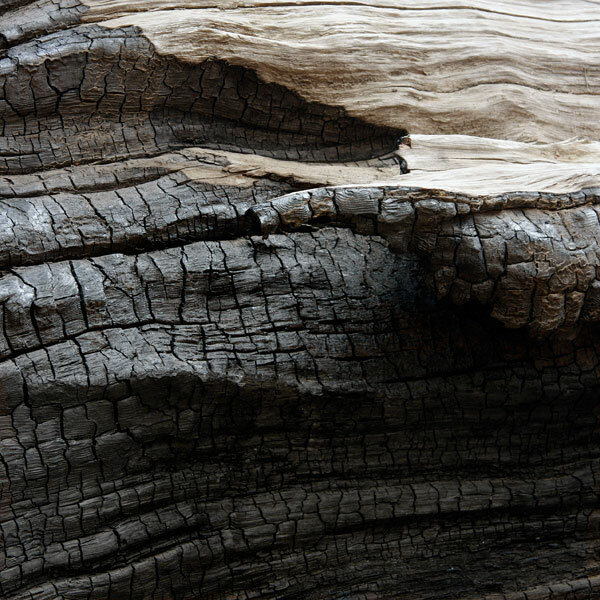 I liked the contrast between the bleached unburnt surface and the grid of soft charcoal. 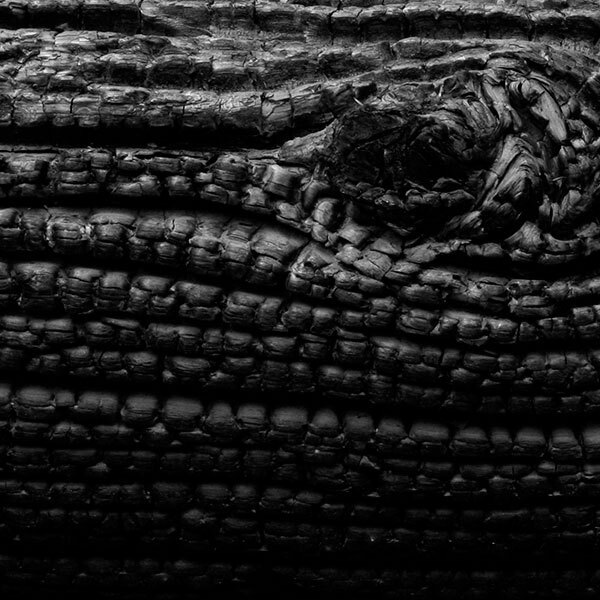 Flames engulfing a fallen conifer created this black satin and deeply reticulated charring. 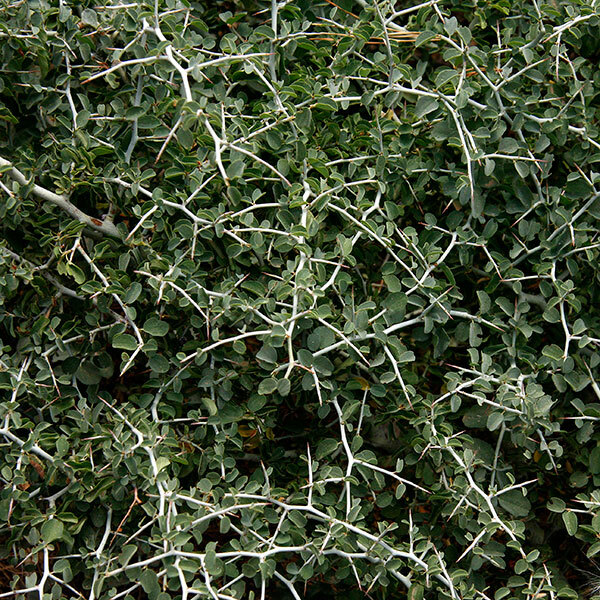 Drifts of this angular grey stemmed shrub grew well in forest clearings. I liked the contrast with the softer forms and greens of the leaves: its identity remains elusive. 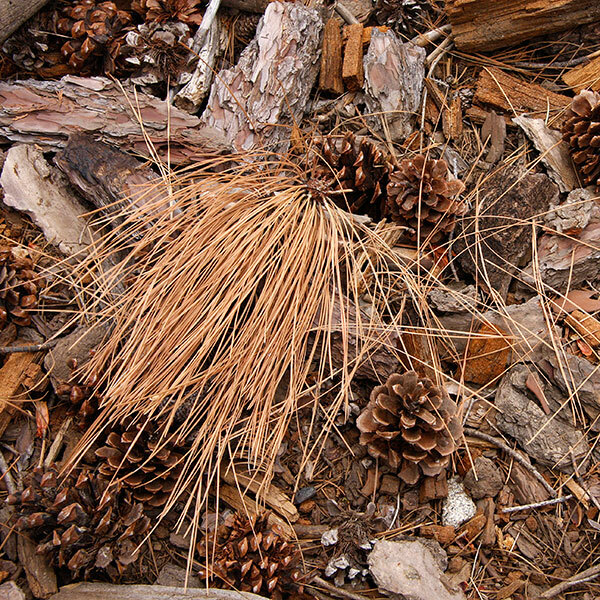 This covering of cones, bark, needles and other forest litter is a modest example of the kindling capable of igniting ferocious fires through lightning strikes or human carelessness. Controlled burning is used to clear such debris as part of risk reduction forest management. A fallen conifer had been cut through to clear the trail. 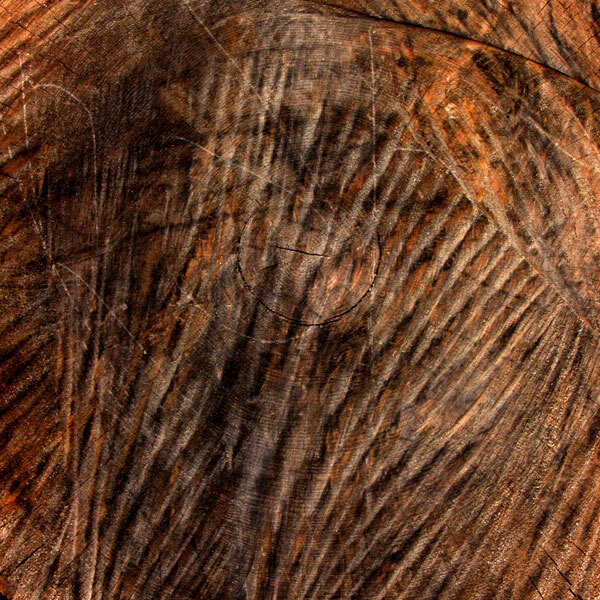 The raw marks created by the saw's teeth and the deep colours of decaying wood almost obliterate the annual growth rings. I liked the contrast between those markings and the flashes of orange animating the composition. 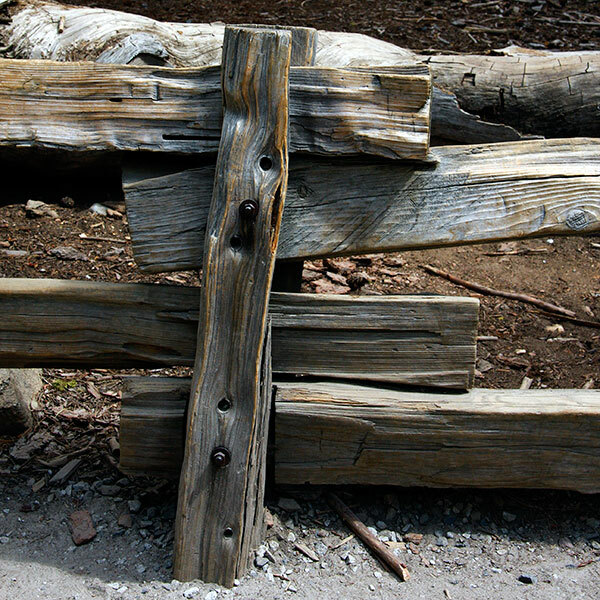 A detail from a low split-wood fencing installed to divert walkers away from a Sequoia. Heavy human traffic compresses the soil, affecting rain absorption and root systems. A heavy cliff fall in the recent past had brought down trees and rocks across the Trail. 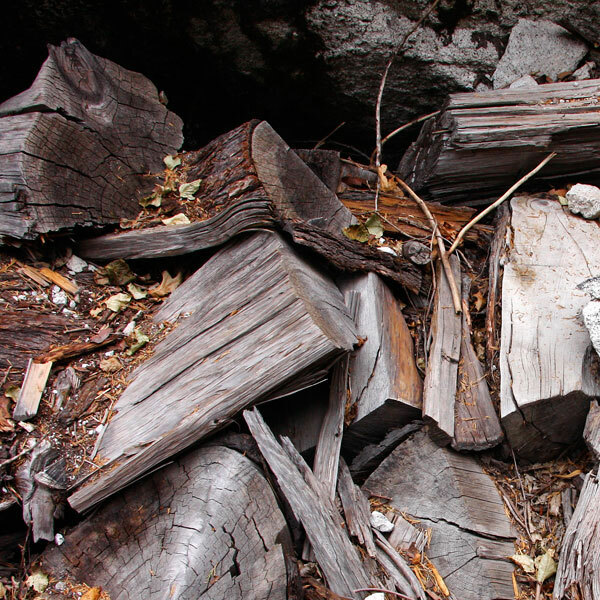 These cut and weathered logs lay amongst boulders cleared to open a more irregular route. The forms, textures and the red-grey colour contrasts appealed. To the west of Yosemite Village the Merced River broadens and slows as it flows through level meadows and woodland. Footpaths give access to its banks and drifts of shingle deposited by floods. 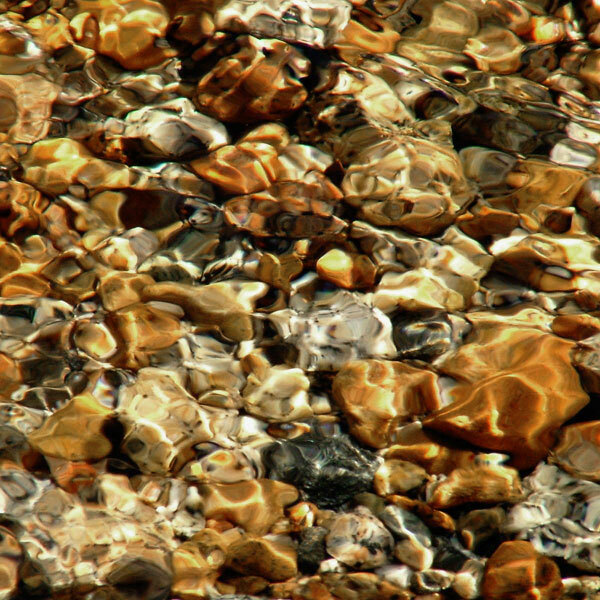 Early morning sunshine is reflected from pebbles beneath tinted water. 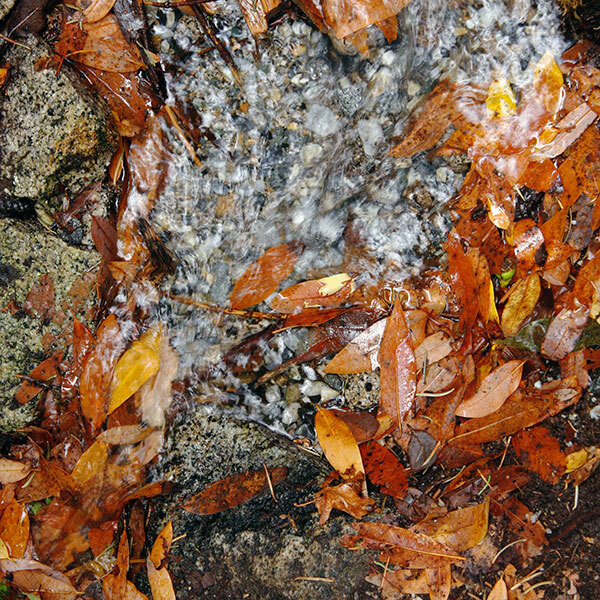 This flame of leaves edged water flowing from a small spring at the side of the Vernal Fall Trail. The lower trail is short, quite easy and very popular. Roughly midway between Happy Isles and Vernal Fall it crosses a bridge that provides a rest and vantage point before the slightly more energetic walking begins. In full flow, the spectacle of rushing water, fine spray and sound roar must excite. On this fine September day I was pleased to see even a modest flow to photograph. Flights of stone steps and boulders on the final approach create a briefly energetic climb to the rim and the pools beyond. 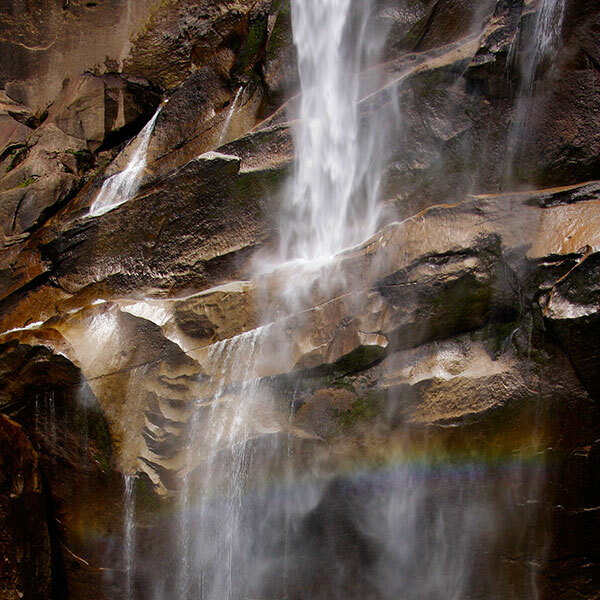 Spring snowmelt bestows “The Mist Trail” as an alternative name. On this day there was barely sufficient flying moisture to dampen surfaces and bring the rock face colours to life. 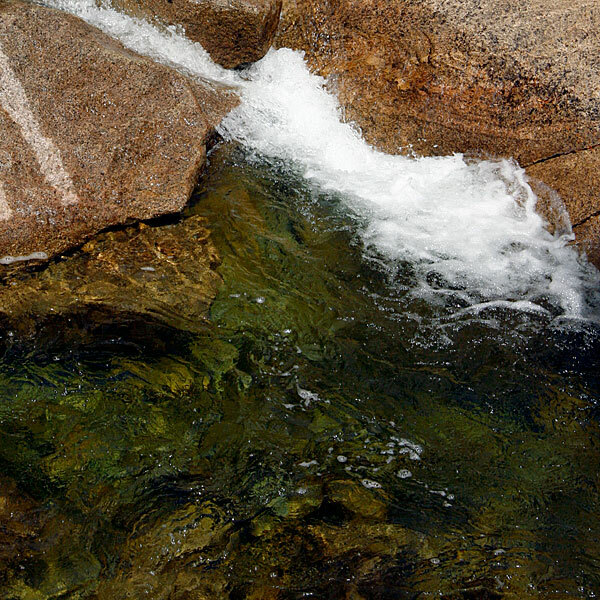 The Merced River drops some three hundred feet from the rim. It would have been good to see and hear the full flow of water but that would have obscured these rock forms and colours. The high, wide and sheer upper face carries vertical bands of soft greens, browns, greys, reds and blacks akin to a monumental abstract painting. 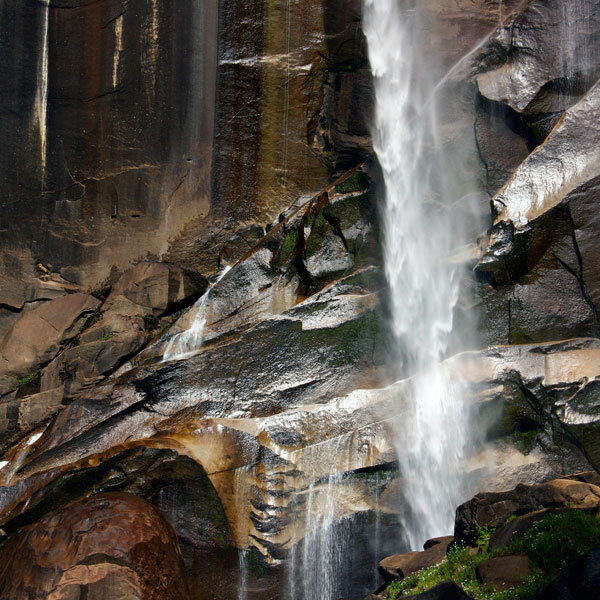 A wider view is posted in the original YOSEMITE FRAGMENTS gallery.